See a unique collection of Vintage Gliders and learn about the history of gliding in the UK. The Gliding Heritage Centre is based at Lasham Airfield the home of Lasham Gliding Society; you can find out how to find us on our Getting Here page. Guided tours start 2pm every Sunday and take about 45 minutes. Meet at the sun dial at the western end of Lasham clubhouse. When you arrive at Lasham Airfield, park behind the gliding club clubhouse in the public car park. Follow the path from the car park into the clubhouse and then either ask at Lasham reception for more information, or, if you are here for a Sunday tour await an announcement on the clubhouse PA system. 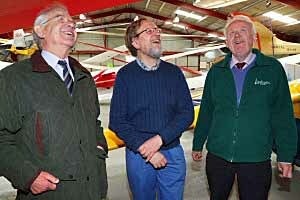 We also welcome individuals and organised groups who wish to visit the Gliding Heritage Centre at any time. If a Sunday afternoon is not a good time for you, or your group is particularly large, then please email us at and we'll be more than happy to arrange a visiting time that suits you best. If you are planning a Sunday visit, why not arrive at Lasham early. Whilst you wait for your tour to begin, enjoy a fine Sunday Lunch and a drink in the Lasham Gliding Club restaurant and bar, where the professional and friendly staff will be more than happy to cater for your every need.